Plot Summary: Just when he thought life was returning to normal, Heero Yuy receives a cryptic message from a person claiming to have stolen the Wing Zero and requesting a rendezvous at a remote space station. There he finds the station deserted except for his fellow Gundam pilots, all of whom have received similar messages. 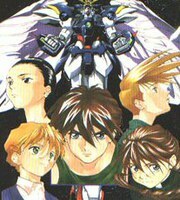 But only a handful of people are capable of piloting the Wing Zero... As tension and distrust grows, Heero is pitted against his comrades with mind control, assassination, and a loaded gun thrown into the standoff.